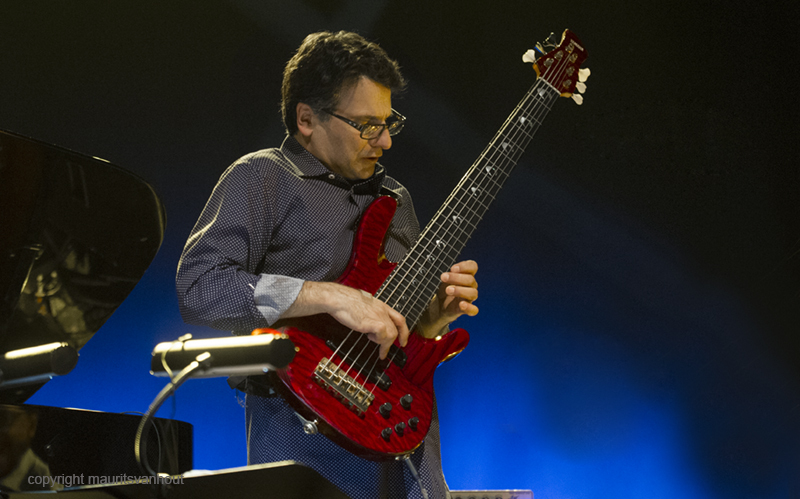 Jazz Belgrade 2014; a good edition with an excellent finish! 20.11.2014. Already a few weeks behind us but still interesting to look back. Jazz Belgrade the celebration edition of 2014 was worthwhile. It was the 30th edition of a Jazz festival which hosted a lot of great musicians throughout the years. To celebrate it, this years edition had an exhibition of photos from the international press covering the last few years. It also had many artifacts and posters from previous editions going 30 years back in time. Like the 1971 edition when the name of the festival was Newport Jazzfestival (connecting with the famous American festival) and a line up of Duke Ellington, Miles Davis, Dizzy Gillespie, Thelonious Monk and more…. This years edition started with a show of the Max Kochetov Quartet, a Serbian Ukraine Quartet lead by Max Kochetov an excellent saxophone player. Modern jazz, good vibes and an excellent young bass player. Lots of improvisations. Good start. Was the first concert seated with a full hall, the next concert was without seats and even more people entered the Danilo Perez concert. Nobody could get in or out. In some moments it looked like a popconcert. For me it was distracting since the quiet intermezzos in the music need a quiet place to listen and feel the music coming to you instead of trying to get a normal place to listen. 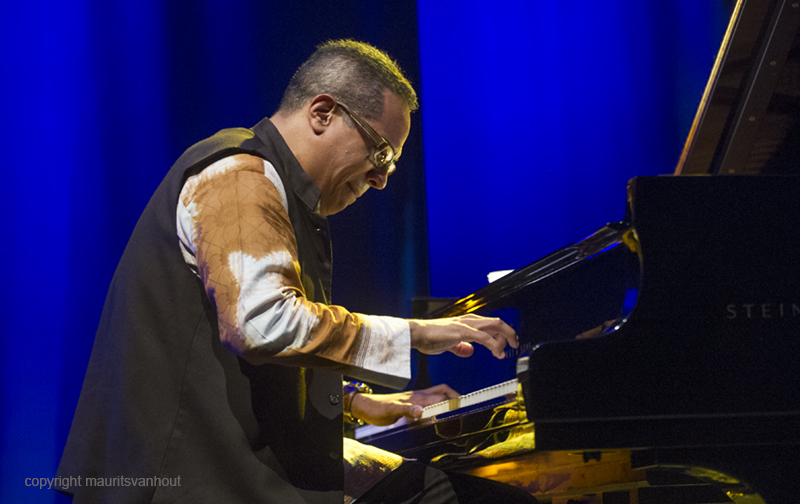 But considering the concert of the Danilo Perez trio it is possible to say a few things. 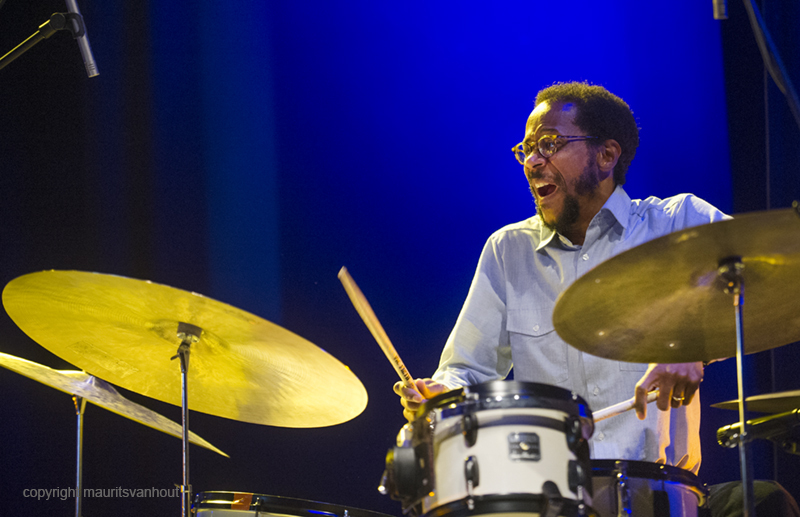 There was the incredible vibe of Brian Blade behind the drums, always pushing the band to a higher level. But as a whole the group sometimes seemed to be playing hasty and Perez was hitting the pianokeys hard and less subtile as he can do. It seemed as if how more people were in the room, the more the musicians turned into themselves, making less contact. I heard them playing better. But the following artist finally made this evening a succes. In the different room upstairs there was the concert of Nils Petter Molvaer and Laurens von Oswald. In this seated room the quality of listening was back and the music was interesting. Molvaer is always trying to get new sounds, to create atmospheres by mixing normal instruments like his trumpet with computer created sounds. But always with a rhythm that shows a direction though never being dull. The combination with “soundmachine” Von Oswald is a good one, since Molvaer has more time to give attention to his interesting trumpet sounds. Day 2 started with Serbian Jazz Bre! A Serbian band with an excellent piano player Aleksandar Jovanovic and great background images made by VJ Ivan Grlic. The passion of percussionist Uros Secerov was giving the show a great boost as well. The next show was all about Vasil Hadzimanov. First he performed with his trio, then later he performed with band in complete different music and then came a great finish David Binney a great altsax player from the United States. I liked this part the most, as it seemed Binney and Hadzimanov had a good musical click. Then the show went on upstairs in the good atmosphere of the Americana Room with Puschnig, Sass and Diabate. To me this was a refreshing concert show so many different influences that almost every song was a surprise. The Austrian Wolfgang with his sax and flute supported the more jazzy compositions while Mamadou Diabate brought us African influences and energy followed by “cool” tuba player Jon Sass. Every song had a story to tell and you never knew the end. A good show. On sunday the 26th of october the evening started with Jacob Anderskov from Denmark who gave the festival a complete new musical influence. A more classical one. 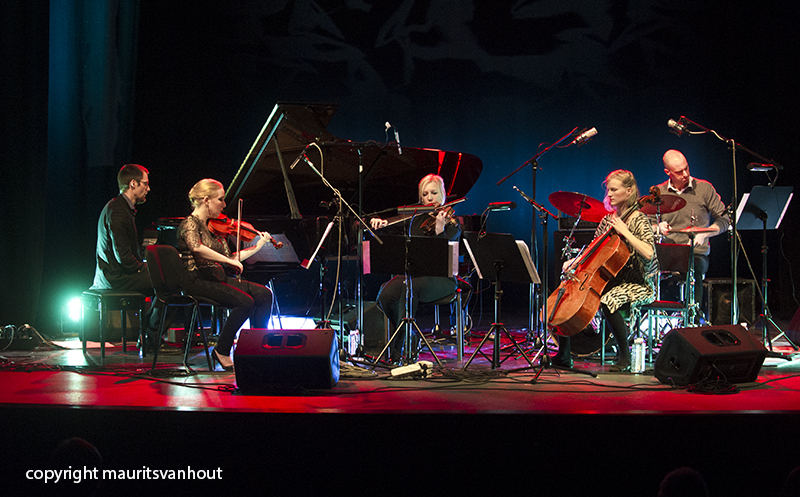 Listeners enjoyed classical strings and classic compositions followed by drums and Anderskov on the piano. Interesting and good start of the 3rd evening. But never a dull moment, so the next show was complete different as Italian trumpet player Paolo Fresu entered the stage. With jokes, a good story about his son and excellent compositions in a modern jazzy way he got the room in his grip en never let go. For many festival visitors one of the highlights of the festival. Upstairs in the American Room the Red Trio from Portugal gave us experimental jazz in a catchy way. If you don’t the experimental jazz or not it did not matter. The energy, the rhythms of Ferrandini on drums and the powerplay of Pinheiro on piano it never let you go. Sylvie Courvoisier, Mark Feldman, Billy Mintz and Scott Colley finished the 3rd evening with a good concert more or less in line with the one before but with the extra of Mark Feldman on violin. I preferred the Red Trio though. But then came the last evening. First the Charles Lloyd Quartet with a new show: “Wild man Dance Suite”. In the morning I met Charles Lloyd in my hotel having breakfast in the same room. A quiet, to me more or less old man entered the room saying nothing, being maybe a bit grumpy.. I don’t know. I left him with his breakfast and did not want to bother him with silly questions. At that time I was thinking: his show is called ” Wild man dance” but how wild could this man be? In the specially for this evening arranged bigger venue Dom Sindikata he proved to me I was completely wrong. This man was really wild, playing his saxophone with so much energy, power and wildness. He made the sax dance and the audience was excited. Combined with his quartet of the more than excellent piano player Gerald Clayton, Eric Harland on drums and Joe Sanders on bass, it was outstanding. 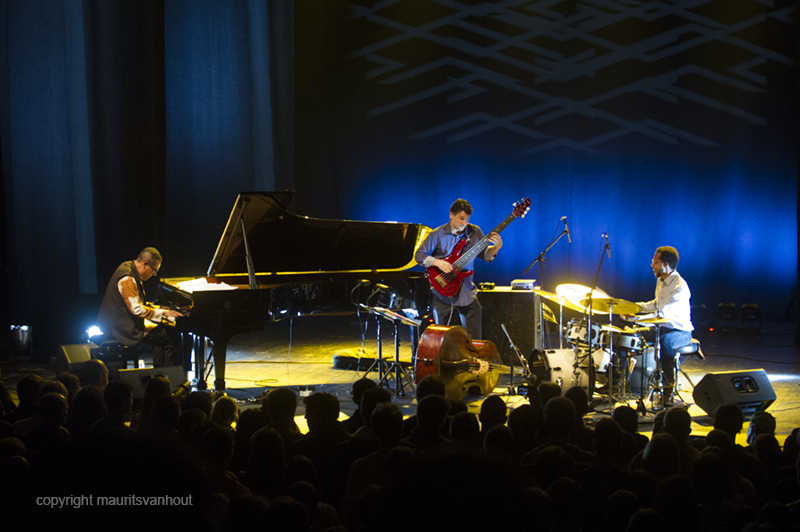 One of the best jazzperformances I saw in years. After the break, in which everybody was catching breath again, there was the last show of the festival. And again a piano player set fire to the room. It was Michel Camilo and his trio. Completely different music so I needed to make a switch in my head. But when the switch was done it was excellent. 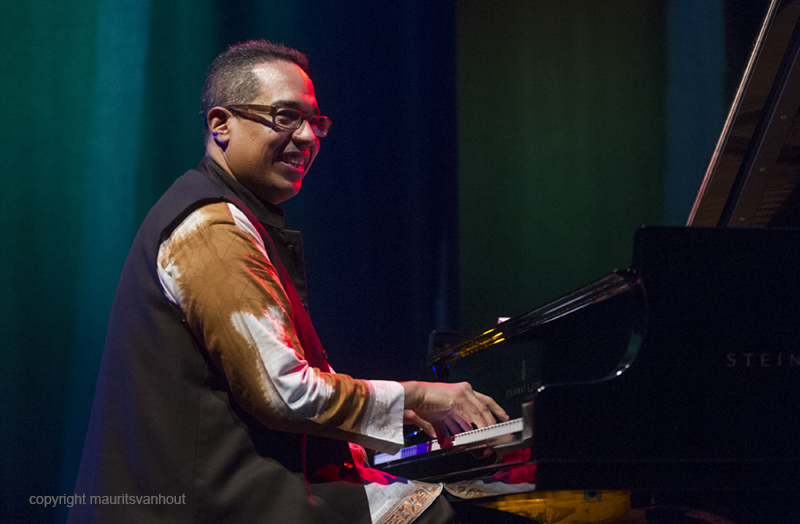 Camilo had so much speed in his fingers that sometimes I was wondering if the piano was not getting burned. It was a remarkable night to end this edition of Jazz Belgrade with for me the best performance of the year, Charles Lloyd. A great compliment for the organization of getting this excellent line up in Belgrade, see you next year!